Date night dinner! Homemade gnocchi with wild mushroom sauce. This vegan meal is so fantastic and delicious, it’s a must for nice dinners in! 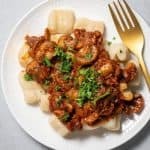 With step-by-step instructions on how to make homemade gnocchi. Preheat oven to 400ºF. Clean potatoes and poke all over with a fork. Bake for 1 hour until really soft. Remove from oven, let cool and peel skins off. Using a ricer, rice potatoes and place in a large bowl. If you don’t have a ricer, mash until there are as few lumps as possible. In a separate bowl, combine the flour, dried herbs, and salt. Slowly add the flour to the potatoes and stir into a dough forms. Wrap dough in plastic and place in fridge for 30 minutes. Once sauce is ready, make the gnocchi. Bring a large pot of salted water to a boil. Place gnocchi in water and cook until they rise to the surface, about 3 minutes. You will do this in batches, being sure not to overcrowd the gnocchi in the sauce pan. Remove with a slotted spoon and place on a cookie sheet in a warm oven. Heat the oil over medium heat. Add mushrooms, let cook for 10 minutes until reduced and caramelized, stirring only a few times. Season with salt and pepper. Add garlic, shallots, rosemary, oregano and cook for 5 more minutes. Add tomato sauce and red wine, stir and cook an additional 5 minutes. Add vegetable broth, reduce to a simmer and cook for 5 more minutes. Remove from heat. Whisk in 1 tbsp. butter and sprinkle with chopped parsley.